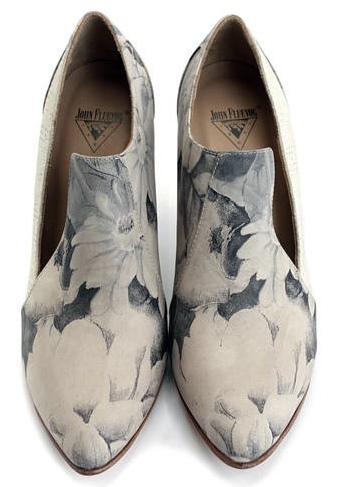 While searching for rose gold loafers (never saw the ones I was looking for), I came across an eye-catching pair of shoes that that then guided me to Canadian footwear designer, John Fluevog. Our Men's Footwear Editor has previously highlighted a John Fluevog men's style on Shoeography, so I'm the one late to this party, but that changes now. we are just a tad obsessed with the John Fluevog Elegant Conversations Kendra Pointed Toe Heels in the above grey floral. This fabulous asymmetrical loafer features an upper with textured panels of leather and a 3 1/2” curved heel. 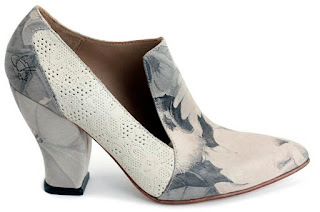 The Kendra runs narrow, so it is advised to go a half size up if you have wide feet. 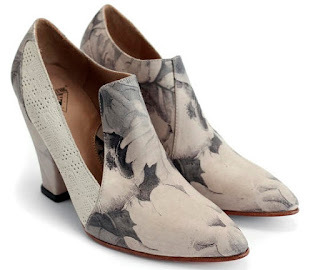 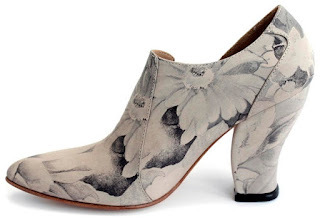 These beautiful, muted floral print heels are available for $269.00 on www.fluevog.com.